Well, this is interesting. Word on the street was that Ander Herrera’s free transfer to PSG in exchange for a mere £200,000-a-week wage was all wrapped up - but wait! According to L’Equipe, a gazumper has emerged in the shape of Arsenal. Ho! Apparently they will swoop in with a similar offer because Unai Emery is a big fan of the Spaniard, and of course they could do with a replacement for the Juventus-bound Aaron Ramsey. Logical to a point, but you can’t escape the feeling that this would be classic Arsenal: giving the money they probably should have given Ramsey to someone slightly older and slightly worse. Textbook. If you watched Ajax’s draw with Juventus this week then you’ll no doubt have been impressed with Brazilian winger David Neres, and you wouldn’t be alone. Apparently Arsenal and Everton are both keen on Neres, and have been chatting about a £34.5million move, which in today’s market feels like a bargain. Borussia Dortmund are also sniffing around. The Manchester clubs are off on a jolly to Portugal, and they hope to come back with some footballers. United are taking a keen look at midfielder Bruno Fernandes, while City are keen on Luka Jović (technically a Benfica player still but on loan at Eintracht Frankfurt) and João Félix (actually a Benfica player), with bids for both in the offing. Burnley are finally set to do something about their surfeit of goalkeepers, and will listen to offers for both Nick Pope and Joe Hart if you want to make one. Everton tried Kurt Zouma and André Gomes and now they want to buy, it seems, although they’re not worried about losing Idrissa Gueye to Manchester United, or to anyone. And finally, step right up sir, step right up! You! Yes you! You with the sack of cash and inflated sense of your own importance! You look very much like a Premier League football club! You’ll be happy to pay, pay, pay! The shrewdest salesmen know a mark when they see one, and according to Spanish truth rag AS, Real Madrid have set a price of €130million on Gareth Bale, and they think that some fat-walleted English club will blindly blunder in and pay the damn money. No matter that £112million is quite a price for a bloke who’s slightly flattered to deceive when he’s not been crocked, and that isn’t really that frequently. Still, eternal optimists that they are, Real think Manchester United are the most likely rubes who will give them what they want, and as trailed before they would be delighted to discuss a player swap, and apparently Paul Pogba is their favoured target. Although other reports suggest Florentino Pérez prefers Christian Eriksen. This will all 100%, definitely, for sure, most certainly happen. During the January transfer window, West Ham were linked with every conceivable striker on the market, and some who very much weren’t on the market. 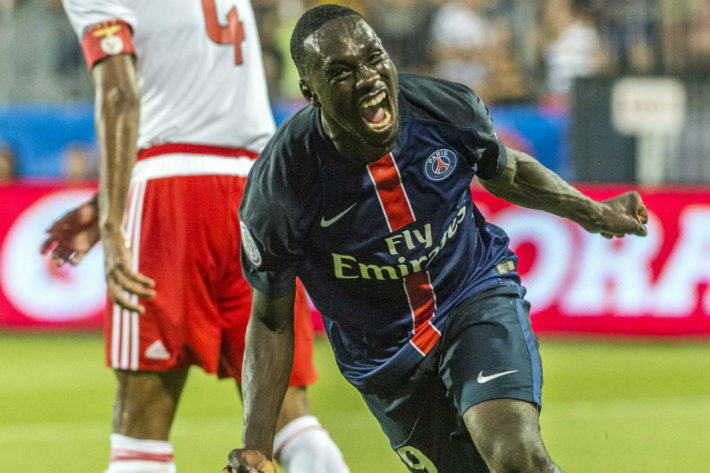 Right at the end of the market, there was a link with Jean-Kévin Augustin. To be frank, there didn’t seem to be great deal in the claims of Hammers interest in the RB Leipzig forward. Now there’s something which may be more interesting. Friday’s edition of L’Equipe looks at a group of players who have left PSG as youngsters. For Augustin they say he’s not playing as much this season for Leipzig as he did in the last campaign, and say there was interest from England in January, with West Ham being the club named. A summer transfer is ‘not excluded’ for the 21 year old, who was also linked with Everton in December of last year. He’s started just three Bundesliga games this season, with a further 13 appearances as a substitute and six starts across the Europa League and DFB Pokal. He has six goals to his name. That return doesn’t seem so bad when it’s considered that despite all those appearances, he’s played for less than 1000 minutes in total. Augustin shows more enthusiasm in that picture alone than Perez has over a whole season. Augustin an August IN!? Has some poetry to it.